The interior of the Astra is designed to create the largest possible survival space in crash conditions. To accommodate the impact force in case of a crash, the front, sides and rear of the passenger compartment are surrounded by energy absorption zones that deform and protect in a controlled manner. Inside the passenger compartment, the new Astra features a three-part approach for the airbag system consisting of front airbags for driver and co-driver, thorax-pelvis side airbags and full-length curtain airbags for the first and second seat rows. Combined with advanced retractors/pre-tensioners with load limiters mounted on the vehicle body, lap pre-tensioners attached to the seats and seat-integrated anti-submarining ramps, the Astra ensures maximum passenger protection and reduces injury potential. 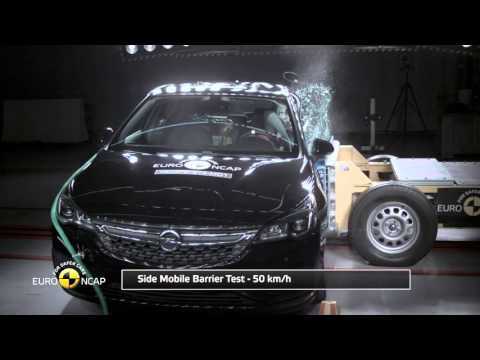 The Astra’s high standards of adult, child and pedestrian protection are complemented by state-of-the-art active safety and driver-assistance systems. Lane Departure Warning with Lane Keep Assist not only warns the driver, but also applies a gentle nudge of corrective steering if the Astra should stray out of its lane. Frontal collisions can be avoided or mitigated thanks to Automated Emergency Braking, Integrated Brake Assist, Forward Collision Alert and Following Distance Indication. The collision warning system is optimised by a row of flashing red LED lights, which are projected onto the windscreen in the driver’s field of vision if the distance to the vehicle in front gets too small and a collision is imminent. The data for these systems is collected by the new Astra’s front camera, installed at the top of the windscreen. The Astra is the first compact car with a front camera from a volume manufacturer and it is also the first Vauxhall providing assisted braking with data received only from the camera. The Astra’s active safety and driver assistance systems are completed by Side Blind Spot Alert (which uses the ultrasonic sensors of the Park Assist system to warn of hidden dangers when changing lanes, overtaking or turning corners) and IntelliLux LED matrix headlights. This advanced lighting technology automatically adapts to the current traffic conditions and always offers the best possible illumination. In addition to driver, occupants and other road users, the Astra also offers “five star” protection for the driver’s wallet and driving licence. Traffic Sign Assist continuously monitors the data provided by the mono camera and compares it with information from the embedded navigation of the Navi 900 Intellilink infotainment system. Speed limits are then displayed to the driver in the instrument cluster, reducing the risk of speeding tickets.